Steamboat Springs native Johnny Spillane won the first ever Olympic medal for an USA Nordic Combined team member today. Spillane’s second place finish brings home a silver medal to Ski Town USA while competing in his fourth Olympics. As with many Steamboat children Spillane started skiing as a toddler at age two. The family lived just two blocks from Howelsen Hill where he started serious ski jumping when he was eleven-years-old. The Steamboat Springs Winter Sports Club has been a major influence for the community’s youth for 97 years with more Olympians coming out of the program than any other in the country. Today’s event was the Men’s Normal Hill Individual combining one ski jump and a 10-kilometer cross-country ski race. Steamboat’s Todd Lodwick placed fourth in today’s competition. Hopes are high for the USA team to bring home more medals from Vancouver in Nordic Combine events. Meanwhile Steamboat’s trademarked Champagne Powder is falling and skiers of all levels are celebrating great skiing and Spillane’s silver medal. There’s only 24 hours left to take advantage of the Pow Pow Platter special deal to ski three of Colorado’s premier resorts for only $99. The Pow Pow Platter serves us one day of skiing at each resort. the offer is only available online and a 48 hour advance purchase is required. To purchase, visit skicolorado.com. The Pow Pow Platter serves up three of Colorado’s finest resorts – Winter Park / Mary Jane, Steamboat, and Copper Mountain for the tasty price of only $33 per day. That’s right, for just $99 you can ski one day at each of these fine mountains. Days do not have to be consecutive. What at great way to get a taste of Colorado slopes! The oldest continuing Winter Carnival west of the Mississippi River kicks off Wednesday, February 3, 2010. The 97th annual festival runs through Sunday the 7th. 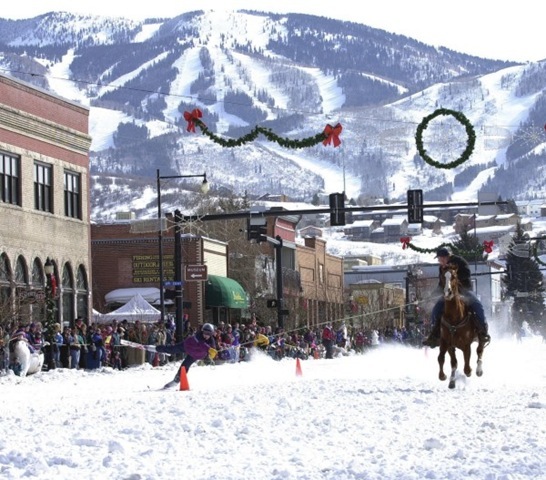 Started in 1914 to relieve residents of mid-winter cabin fever the five days of competition and frivolity is organized by the Steamboat Springs Winter Sports Club. The group is one of the largest and oldest winter sports clubs in the U.S.
Events highlight Steamboat’s winter sport traditions with ski jumping competitions, cross-country obstacle race, telemark challenge, snowboarding jam session, soda pop slalom, dual slalom bicycle race and tubing party. Saturday evening all eyes focus on Howelsen Hill for Night Extravaganza featuring a winter sports exhibition, torchlight parades, fiery hoop jumpers, the legionary Lighted Man and elaborate fireworks. 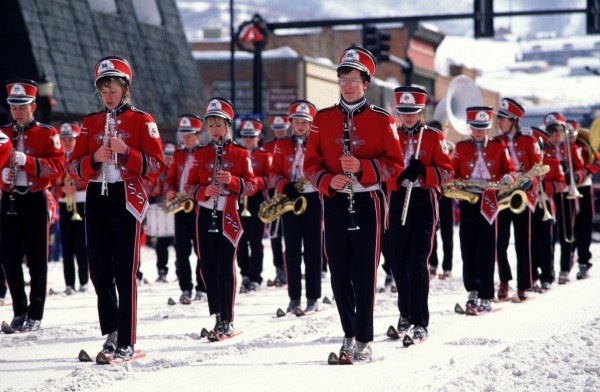 On Sunday the Diamond Hitch Parade down Lincoln Avenue includes the only ski marching high school band in the country. The Steamboat Springs High School Band has been participating since 1935 with their unique propulsion. Kids from infant to 14-years-old compete in the street events when snow covers Lincoln Avenue and spectators line the street to watch 3-legged races- on skis of course, obstacle courses and Dog and Dad Dashes. Children five and younger are pulled on a sled or toboggan by the family dog or dad on all fours. Horse events – ring and box, ski joring, street slalom and donkey jump – mark Steamboat’s western heritage. Adults get in the act with shovel races. Positioned in shovels contestants race down the street pulled by a horse, falling off the shovel is immediate disqualification. The horses used in the competitions are highly trained and specially shodded with cleats for traction in the snow. For three generations a number of Routt County families have served as skilled riders. Spectators and event participants are encouraged to purchase ($7) and wear an official Winter Carnival button. Proceeds support the SSWSC and its athletes, seventy of whom have excel to Olympic competition level. Join the citizens of Ski Town USA for the community’s Olympian Send-off Friday (Feb. 5, 2010) at 6:30pm on the lawn of the downtown Courthouse. When You Go: Information on Winter Carnival events from Steamboat Springs Winter Sports Club. With more than a three foot base, daytime highs hovering around the freezing mark and snow forecasted for three of the next five days the skiing is great. With the Breakaway Package you’re save at least 20% on lodging, lift tickets and ski rentals. For more information on planning your visit contact the Steamboat Springs Chamber Resort Association. More than two feet of fresh powder in the last week, the sun is out, the sky is blue – how many more reasons do you need to escape to Crested Butte for great skiing? Does lodging and skiing for $99 cinch the deal? 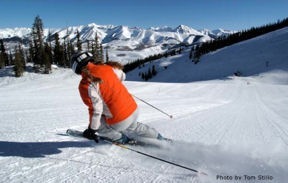 Call Crested Butte Vacations at 800-810-7669 to reserve your stay during this limited time offer. The package price is per person, per night and includes one day adult lift ticket and lodging for one night at The Grand Lodge Crested Butte in either a 2 King Emmons Studio or a Standard King Suite, based on double occupancy. Valid for travel through 2/12/10. This package deal is only available by calling Crested Butte Vacations. Call now to enjoy the legendary terrain and excellent conditions on uncrowded slopes. Skip the traffic and head to Crested Butte. Vail Ski Resort has trademarked the slogan, “Like Nothing on Earth.” After last week’s chairlift misadventure perhaps they should add, “… or in the Air.” Today’s much viewed web photos include the unfortunate skier who slipped through a Vail chairlift and hung suspended by his pants for 7 minutes until lift operators came to the “rescue.” Apparently the seat wasn’t properly in place when he boarded. Besides going through the ordeal, now the victim finds his bare buns spread across computer and television screens and a hot topic for comedians. An overlooked part of the story is the child that boarded the same chair. In some of the photos you can see the youngster still on the chairlift. I think this kid should get some kind of reward for not panicking. Wonder how he/she feels about chairlifts today. The photographer that took the picture is in trouble with his employer. What about a couple of lift operators? If you have not seen the photos and feel the need, http://www.thesmokinggun.com/archive/years/2009/0106091vail5.html.